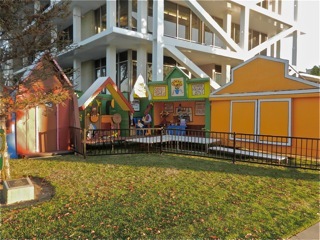 In a press release this morning Interim Communications Director Bill Lobdell announced that the Snoopy House display on the front lawn of the Costa Mesa City Hall will have a Grand unveiling and lighting ceremony tomorrow, Tuesday, December 13th at 5:30 p.m. Volunteers worked tirelessly over the weekend to construct the various components of this traditional display and should have all the subtle nuances of the operations finished before the ceremony. However, more volunteers are needed to help with the operation of this display over the holidays, from December 13th through New Year's Eve. Santa Claus will be visiting nightly from December 13th through December 23rd. Service clubs, youth groups and any other available volunteers who wish to help should contact Sylvia Chalmers at 714-754-5099. The community is invited to the opening night celebration of the Snoopy House holiday display at 5:30 p.m. Tuesday at its new home at Costa Mesa City Hall. 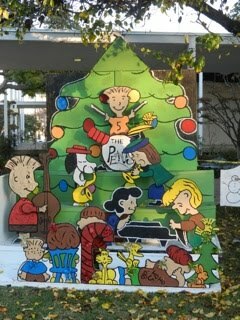 The elaborate display of Peanuts characters has been an Orange County holiday tradition for 45 years, attracting an estimated 80,000 visitors annually. But this year, due to a home foreclosure, the future of the Snoopy House had been in jeopardy until the City of Costa Mesa stepped forward last week and agreed to host the display and provide other assistance. The Snoopy House will be available for viewing from 5 to 10 p.m. nightly through New Year’s Eve. 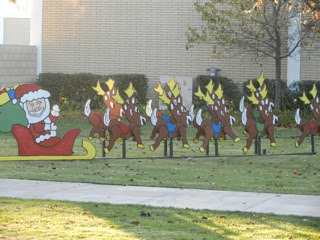 And Santa will be visiting from Dec. 13 to Dec. 23. Children and their families can get free photos with Santa. In addition to the Snoopy House, the City of Costa Mesa is putting on its first Holiday Lights Spectacular, which will involve more than 100 spotlights that will change colors with the help of a computer program and be shown against the mid-century modern, exposed white beams of City Hall. The opening night ceremony will be hosted by City Chief Executive Officer Tom Hatch and feature carols sung by a local choir, short speeches by City council members, special Snoopy cheers from Costa Mesa High School cheerleaders, and a heartfelt thanks to the community from Jim Jordan, whose family has put on the Snoopy House for more than four decades. 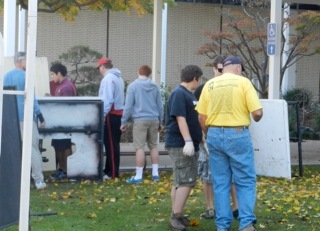 Because of this year’s unusual circumstances, the 45th annual Snoopy House has been put together in little more than one week. The City and the Jordan family are still looking for volunteers, community groups (for both nightly entertainment and for volunteers), and donations. Those interested in volunteering or contributing a needed item or money can contact City staff member Sylvia Chalmers at (714) 754-5099 or e-mail her here. 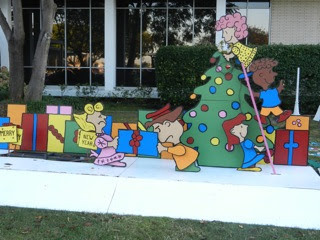 Kudos need to go to Chuck Perry for bringing the idea of using City Hall for the display to Tom Hatch. Somehow the "political guys" and media are giving too much credit to others. In any event, a really good story for CM. This had potential until I read the press release part about short speeches from city council members. These clowns never miss an opportunity to try and steal some spotlight and grab some credit for the work of others. I can hardly wait until Righeimer calls the Snoopy Christmas unsustainable and that the Unions are responsible for the foreclosure! This pathetically lame and morally bankrupt council spends more time in turning city hall into a circus rather than run our city like the professionals from Irvine's city council. Hard working employees will be losing their jobs due to a political stunt and they're busy promoting camp snoopy like everything's fine. What a moronic city Costa Mesa has become. More disgruntled and greedy employees--Irvine employees get illegal bonuses, so should we! Can't even be happy for our City for something like this. Clearly, you don't live in our City. I feel so sorry for you. Proud to live here and happy for what a lot of people have done to bring this here. Whatever happened to doing a good thing just to do a good thing, and not so you can continually publicize it and pat yourselves on the back? It's great that they moved it all over to City Hall, but leave it at that. Now you have Hatch writing editorials and Lobdell issuing press releases, and the City Council making speeches. We get it - you guys care. As Charlie Brown himself would say...wait for it... GOOD GRIEF!